Rishab Steel Indutsries is PED approved Carbon Steel Weld Neck Flange manufacturer in India.We have extensive experience in supplying Carbon Steel Weld Neck Flange are stocked or available in the following range of sizes and materials for the petrochemical, oil, gas and allied industries. 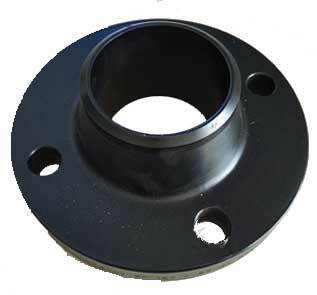 Weld Neck Flange can be assembled and disassembled easily with Pipes. SS Weld Neck Flange can be forged or plate. 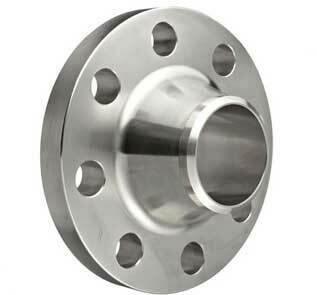 We have reputed name as Stainless Steel Weld Neck Flange manufacturer in India we offer these Copper Weld Neck Flange, Copper Nickel Weld Neck Flange, Brass Weld Neck Flange,Hastelloy Weld Neck Flange, Inconel Weld Neck Flange, Monel Weld Neck Flange, Alloy 20 Weld Neck Flange, Aluminium Weld Neck Flange, Nickel Weld Neck Flange, Duplex Weld Neck Flange, Super Duplex Weld Neck Flange, Incoloy Weld Neck Flange, 254 Smo Weld Neck Flange and Titanium Weld Neck Flange in all standard in which the common world standards include ASA/ ANSI/ ASME (USA), BS10 (British/ Australian), PN/ DIN (European) and JIS/ KS (Japanese/ Korean). Many Alloy Steel Weld Neck Flange manufacturer in India produce these Carbon Steel Weld Neck Flange from forged materials and have machined surfaces. Compare our price from Weld Neck Flange manufacturers in India or China you will find best rate from our company. Weld Neck Flange Class 150 has excellent resistance to chloride-ion stress-corrosion cracking, and as well shows appropriate resistance to a number of oxidizing environments. Weld Neck Flanges ASME B16.5 Clas 300 is very much resistant to chemical corrosion and oxidation (corrosion resistant), and has some high stress-rupture effectiveness and low creep rates under high stresses at temperatures after suitable heat treatment. Our Long Weld Neck Flanges are accessible to our valuable customers in different range of diameters (d), wall thicknesses (w) and sizes (nom. Pipe Size) in customized form (as per customer requirment or order) and also at quite affordable rates (Best Price In India). 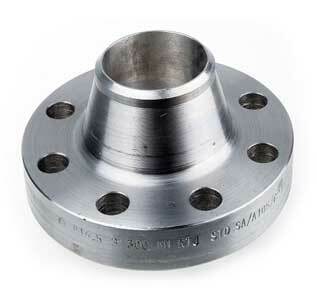 Buy Weld Neck Flange A105 at best price in India. 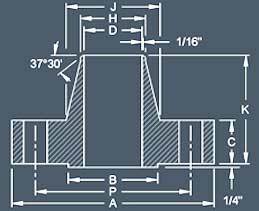 A Weld Neck Flange (BLRF) is a plate for covering or closing the end of a pipe. A Weld Neck Flange Joint is a connection of pipes, where the connecting pieces have flanges by which the parts are bolted together. Find Online From suitable Long Weld Neck Flange manufacturers in UAE, Singapore, Australia,Qatar, UK, India, South Africa and Dubai. Visit Stainless Steel Weld Neck Flange manufacturers factory in India,Contact us for Alloy Steel Weld Neck Flange free sample.Save up to 40% on Carbon Steel Weld Neck Flange. Please note this is an approx Price of Weld Neck Flange in India. For final Weld Neck Flange price in India please contact us. High quality Weld Neck Flange manufacturers in India offer these Carbon Steel Weld Neck Flange in DIN, EN, BS, ISO, JIS or ANSI standard. Brass Weld Neck Flange 3602 / 2604 / H59 / H62 / etc. Aluminium Weld Neck Flange 5052 /6061/ 6063 / 2017 / 7075 / etc. Rishabh Steel Industries is a manufacturer, exporter and supplier of Weld Neck Flange offering in all Ratings up to 1500#, built a distribution network with more then 55 countries worldwide. 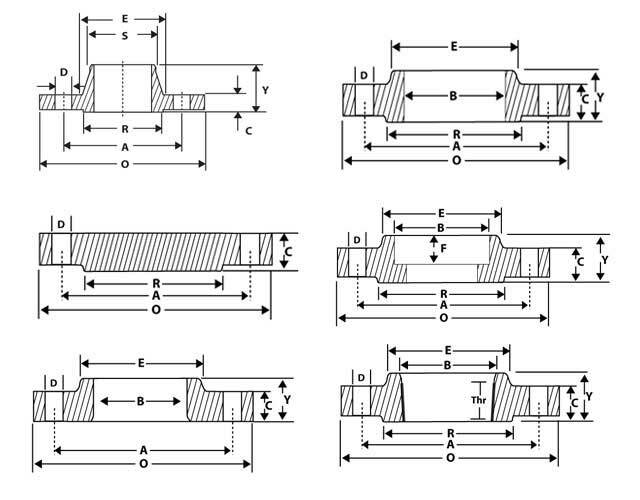 Nominal Outside Inside Outside Sectional Dimensions of Flange Bolt Hole Nominal Approx. Manufacturing Stainless Steel Weld Neck Flange in India, Rishabh Steel Industries holds a wide array of Alloy Steel Weld Neck Flange in all Sizes and Thickness, stock for immediate despatch throughout India & worldwide. Rishabh Steel Industries is a Govt. approved Carbon Steel Weld Neck Flange exporter in India. Our offered Stainless Steel Weld Neck Flange are manufactured and tested tonational and international standards, and specifications as per ASTM, EN,DIN, JIS etc. Rishabh Steel Industries has reputed name as a trusted vendor of Alloy Steel Weld Neck Flange distributor & dealer in your country. We have largest independent inventory in Middle East, UK, Asia, GCC, Gulf to supply with over 30 countries, we provide after sales service and fast delivery.